If we were looking for a sign that the Best Li'l Speedlight ever made has been put out to pasture, this is probably it. Sadly, it looks like Nikon is clearing SB-800s off of the shelves to make space for the newer, bigger, faster, more 'spensiver SB-900. Hit the jump for just how cheap they are, and your best game plan to get one. Normally, I am not a huge fan of Best Buy. But this is one instance where it may be worth it to put up with them. From the Strobist Flickr threads varying reports of deep discounted SB-800s available at Best Buys across the country. Best Buy Online for $399.95 (puh-lease -- they are $319.95 everywhere else) is "sold out" but the bricks-and-mortar stores are cutting them loose (new and demos) for way less. I have see everything down to $159.95. That's a steal. Call your local Best Buy and see if they have any in stock. They can also look up other local stores, check stock and quote prices. Different stores will have different prices. 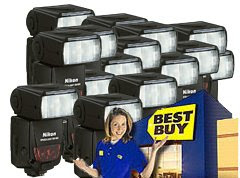 Example: Gatihersburg, MD had two for $279.95, but nearby Pentagon City (Washington, D.C.) had two in stock for $199.95. Word to the wise: These will not last long. Better that we get them than those Photo.net guys. And if you hear of other national chains doing the same, please hit us in the comments. As soon as you finish skimming your local stores, of course.